Edited by Jonathan Freedman and Steven Mayers. Trade Paper • ISBN-13:9781608466184 • US $19.95 • 5.5 in x 8.5 in • 320 pgs. A collection of oral histories told by the thousands of young people fleeing violence and poverty in Central America. They are a mass migration of thousands, yet each on travels alone. Solito, Solita, (“Alone, Alone”), is a Voice of Witness collection of oral histories which tell the story of youth refugees fleeing their home countries and traveling for hundreds of miles seeking safety and protection in America. These powerful narrators describe why they fled their homes, what happened on their dangerous journeys through Mexico, how they crossed the border, and their ongoing struggle to survive in the United States. In our era of fear, xenophobia, and outright lies, these stories amplify the powerful voices of immigrant youth. What can they teach us about abuse and abandonment, bravery and resilience, hypocrisy and hope? In fitful bursts or breathless revelations, they bring us into their hearts and onto streets filled with the lure of freedom and fraught with violence. 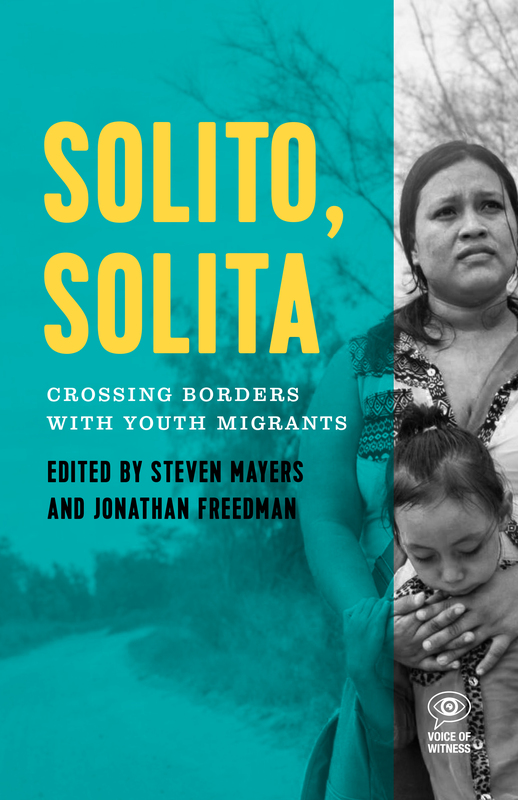 From fending off kidnappers with knives and being locked in freezing holding cells to tearful reunions with parents, Solito, Solita’s evocative stories bring to light the authentic experiences of young people struggling for a better life across the border. Voice of Witness (VOW) advances human rights by amplifying the voices of people impacted by injustice. Cofounded by author Dave Eggers, writer and educator Mimi Lok, and physician Lola Vollen, the work of VOW is driven by the transformative power of the story, and by a strong belief that an understanding of crucial issues is incomplete without deep listening and learning from people who have experienced injustice firsthand. Steven Mayers is a writer, oral historian and Professor of English at the City College of San Francisco. Jonathan Freedman is a Pulitzer prize-winning journalist, author, and writing mentor at the City College of San Francisco. His novel, The Last Brazil of Benjamin East, (2014 Bright Lights Press) was critically acclaimed. He graduated from Columbia University, traveled overland from America to Bolivia, and lived in Brazil, Spain, Portugal, and Switzerland. He was awarded a Pulitzer Prize in Distinguished Editorial Writing for his prophetic editorials calling for immigration reform.